Taking a trip? Keep your house safe with these easy tips. It’s summer break. Your bags are packed, your guidebook (and trashy novels) are in hand — you and your family are ready to enjoy a well-deserved vacation. Before you hop in the car or board the plane, though, remember to ready your home for your time away. The last thing you want to spoil a vacation is worrying about the house you’re leaving behind. To help, we’ve put together a simple vacation home checklist. For families traveling during the dog days of summer, preparing your house for vacation means that both temperature and humidity should be maintained at appropriate levels. 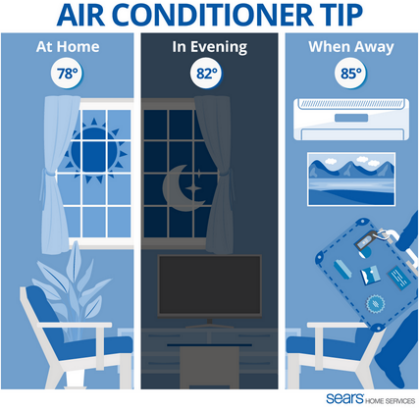 Setting your system in the 82º to 85º range in the summer and at 65º in the winter are good benchmarks, says Allen Gast, director of product management for heating, ventilation and air conditioning at Sears Home Improvement Products. While you don’t want to waste energy cooling a home where no one is residing, you also don’t want the air to condensate, as too much heat can negatively affect wooden furniture and fixtures. 2. Address the water and plumbing. Don’t forget about the plumbing when ticking off items on your vacation checklist. Whether or not you should turn off the main water valve depends on the time of year, says Dave Lincon, director of product management and business development at Sears Home Improvement Products. If there’s a freeze warning, it might be better to let a faucet drip to avoid freezing pipes. No matter what time of year, however, homeowners should consider turning off the water to toilets and the washing machine for trips of any length. Your vacation checklist should also include unplugging electronics like TVs, computers and stereos. Doing so can prevent excess power use while you’re away. In addition, Lincon also advocates unplugging small, heat-generating appliances, such as coffee pots, hot plates, crockpots and hair dryers. While preparing your house for vacation, you should also consider setting the water heater and refrigerator to moderate temperatures. Good advice for closing up your summer home: Families who can completely empty the fridge, leaving it unplugged — with a box of baking soda inside and the door propped open — will see even more dramatic savings. 4. Consider remote system monitoring. Remote systems that monitor everything in your home, from your sump pump to the thermostat to lighting can be a homeowner’s best friend while traveling, Lincon says. Look into a variety of alarm systems that will contact you by phone, text or email if anything goes wrong. Such security devices can sometimes even allow remote access to control them from afar. Another benefit? You can set timers or remotely control turning lights on and off — making your home far less attractive to any prospective burglars. Follow these tips so you can enjoy a worry-free vacation.